Of the Regular Polytopes The simplest shape in any dimension is called a simplex. 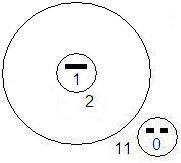 The diagrams below show that the simplexes, the partitions of n and the permutations of yin and yang are intimately related. It is my belief that there is also a link with the Elemental Concepts. Beyond dimensional space is Oneness. The simplest regular shape in 0 dimensional space is the point. The simplest regular shape in 1 dimensional space is the line. The simplest regular shape in 2 dimensional space is the equilateral triangle.It adds to 14 in every direction through the center. The simplest regular shape in 3 dimensional space is the tetrahedon. 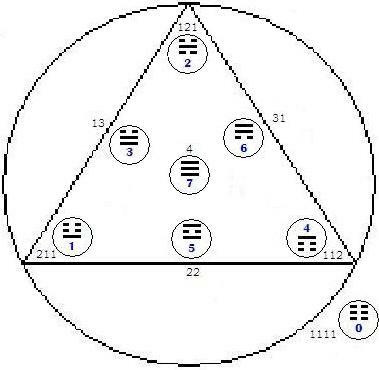 The unbroken yang lines represent 1 and the broken lines represent 0. so the trigram above being composed of 3 solid lines has a value of 1+2+4=7. 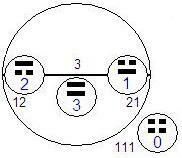 In common binary notation it would be written as 111.